Arriba Vista Ranch is proud to host many events and clinics throughout the year. Jane Weatherwax is an FEI 4-star judge (previously called ‘I’ rated) as well as a U.S. Equestrian Federation and Equine Canada ‘S’ judge. She judges extensively throughout the U.S. and Canada, and has judged continental Championships in both Europe and North America. Most recently, she was on the panel of judges at the U.S. Selection Trials for the 2012 London Olympics. Jane had the honor of judging the 2007 Pan American Games held in Brazil. 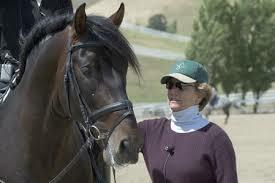 Jane also was the clinician for the 2011 CDS Adult Amateur clinics. Traveling the world as the daughter of a career naval officer, she received her foundation in dressage while living in Europe. Jane has been an active trainer, instructor and competitor for more than 30 years, and has brought many horses up through the FEI levels. Besides her busy judging schedule, Jane finds time to give several clinics around the U.S. and enjoys working on her lovely garden and vintage home in Petaluma, California.